In Northern California in 1955 there was still at least one person who was raising pasture pigs and finishing them on acorns. He would breed about 50 sows to have pigs in February and March. In April, he would go into the mountains with the sows and their pigs. The pigs were herded by one man. Someone would bring supplies to him each week. These animals grazed thru the spring and summer on grass. Then when fall came there was some grass and lots of acorns. When the young pigs got fat they were brought to the valley and sent to market. The sows were bred again and they were ready to start a new year. The person would herd 300 pigs or more for about eight months. For people who want to have pasture pigs, it really helps to take a little time and learn how to work pigs. Pigs have been kept in pens for so many years that there are not that many people who know how to work them out in open areas. They are not that hard to work. Lack of knowledge is the major problem. 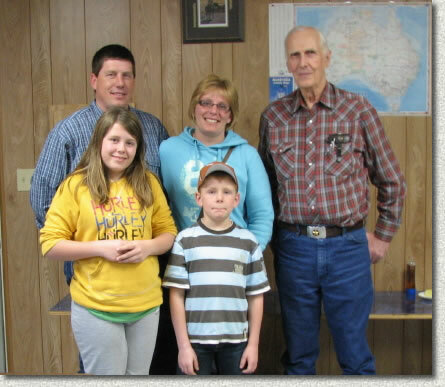 We thoroughly enjoyed our day with Paul and Lori Kinnee and their children Raelle and Josh. They came from Alberta Canada to get warmed up and to get some personal tutoring from Bud at a One-on-One March 21.
. . . 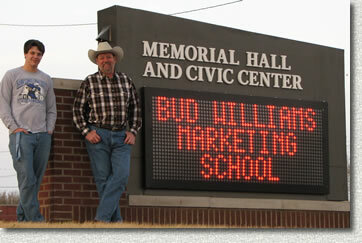 I really enjoyed learning from you and Bud at the 71 ranch and am already seeing results. I loaded a bull in the trailer on foot out in the middle of the range using what you and Bud taught. I’ve also modified our sheep corrals and they are responding a lot better with having pressure applied in the right place. . . . Thanks for all that you do. Spending, is it really a disease? Alcoholism is considered a disease. Drug addiction is considered a disease. Gambling is considered a disease. Overweight is also said to be a disease. 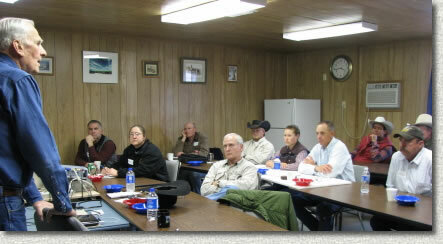 We had an interesting group at our Stockmanship School here at Bowie March 13-14, 2009 including Dairy people from Minnesota, Buffalo ranchers from New Mexico, and Beef cattle folks from Kansas, Mississippi, and Oklahoma.